Home » Recruiting » THE ONLY SKILL I NEED TO SUCCEED IN NETWORK MARKETING. 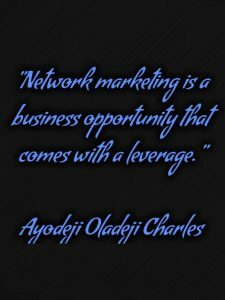 Network marketing is a business opportunity that comes with a leverage. You will leverage on people’s skills, you will leverage on people’s time, money and ideas but for all these leverages to be at work, you will need what I call recruiting power. You will have to work at a specific period to recruit the ideal team player into your team. Today, we want to look at why and how to recruit effectively 20 people in a month and subsequently. To start with, You need to know the BASICS of network marketing before any other thing. So let’s go to the basics. You need some skills to give you an edge over others.This is not competition but going pro, you know as a naija marketing pro. 1. You need to be coachable: When you are coachable, you will do things differently and you will surely get different result that are better than the best. 2. 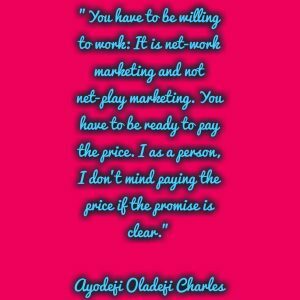 You have to be willing to work: It is net-work marketing and not net-play marketing. You have to be ready to pay the price. I as a person, I don’t mind paying the price if the promise is clear. 3. You need to have a desire to fulfill: What creates a desire? It’s not the money, you have to put emotional attachment to the money. What will the money do for you? Create a clear picture of your future beginning from the end in mind. You need to see it first in your head before it comes to your hand. Know WHY you are in the business because when things go tough and believe me, it will. Your WHY will make the HOW easier. It will help you stay strong enough long enough. I have had reasons to quit, I tell you reality, I have always wanted to quit, everyday, I wanted to quit like more than 100 times but my WHY kept me going. This is the reality, be tough on your WHY today so that your WHY won’t be rough on you tomorrow. 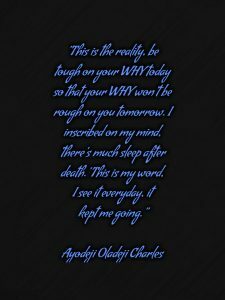 I inscribed on my mind, ‘there’s much sleep after death.’ This is my word, I see it everyday, it kept me going. Get this, It is not the how tools that doesn’t work but how you do the how tools matters. Network marketing works, it is not the industry that is bad, you are the one that is bad. It is all about attitude. It’s just like someone saying that the gym doesn’t work. Is it the gym or you that won’t work? 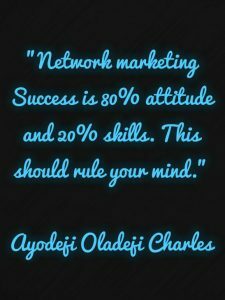 Network marketing Success is 80% attitude and 20% skills. This should rule your mind. The only skill you need to get success in network marketing is recruiting, recruiting and recruiting. That’s the only skill, your success in this industry is depended on you and 80% of your new intakes. This is the more reason why you should never stop recruiting. If you have a job currently, please don’t quit yet, recruit your boss before you quit and make sure your monthly income in network marketing exceeds your monthly expenses and if you do not have a job, go full time and go pro. Let me tell you this, I don’t care what anyone calls me now when I am working on my goals, I go wild, what I know is that in the next few years like 1or 2, nobody can call me broke and those people calling me names now will come back and say that I know that you can do it, oh yeah you did it!! Be wary of people like that in your cycle, they act like friends and of which they are enemies, they are simply FRIENDENEMIES. So be careful. Don’t let them pull you down instead rock and roll it up!!! You can do this. Let’s talk about success compression. I learnt this from Eric Worre. If you get 20 recruits in 6 months, you probably going to get 8 people that will do a little something, you will get 4 people that will disappear out of the 8 and you will get 1 maybe that will stick and stay. So getting 20 people, instead of getting them in 6 months, we compress it to 30 days and here’s what the numbers would be and you know what, I work with numbers and I know that numbers works. So if I recruit 20 people in 30 days, 12 are going to do something versus 8 as said earlier on for 6 months. This will give you more momentum, more excitement and you will have more stories to share. 8 out of the 12 will look like leaders in the next 90 days but in the next months, you will have 4 people that will be working like silent builders and over the next 3 -5 years, 2 top mlm leaders will pop up out of the 4 and most of the time, it is not who we recruit but who they lead us to. Now, imagine if we can do that over and over again and again. 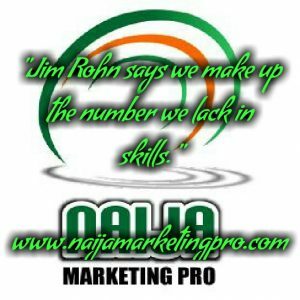 Jim Rohn says we make up the number we lack in skills. This is what changed my attitude. So what does that mean, if you talk to 10 people, if you are not so good, you will get 1 person out of the 10 people. And if you are really good, you may get 9 out of the 10 people. So you can make up in numbers what you lack in skills. 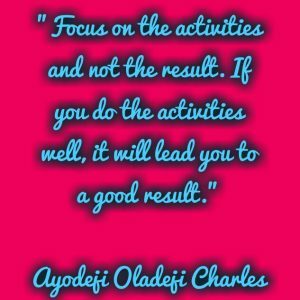 Focus on the activities and not the result. If you do the activities well, it will lead you to a good result. So, what will those numbers do for you? These are your assets. They are customer or leaders getters I don’t want to be the best getters in my team. Note this, you must be ready to put in short term pain for a long term gain. Most people won’t do what successful people will do, in the same vein, successful people won’t do what most people do and you are not most people. You are YOU. You see when I was growing up, my father says it is either you play now or pay later or you pay now or play later, in whatever way, you have to pay. So, choose the pay. So how do we go? First of all, change your attitude to gratitude. Make your list, am not going to teach you how to make your list but if your list is not more than 700 people, you are not serious and don’t prejudge. 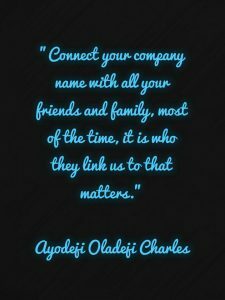 Connect your company name with all your friends and family, most of the time, it is who they link us to that matters. If you are going to recruit 30 people in 30 days, let’s say you have a list of 300 people, so a day, using the third party tools like company video and pictures etc, on average, let’s say 2 people will join you after reviewing the tools. Let’s say am just starting and really bad, 1 out of 10, so if I am good, many at times, it is either 3 or 4. So if you are having 100 people that are reviewing your videos, you will get average of 20 people. Does that make some sense? So how many presentations would you have to have to do that? If you are recruiting 30 people in 6 months, probably 100 presentation, if you are recruiting 20 in a month by 60 -70%. How many appointments would you have to have? I would say 90, how many calls would you have to make, perhaps 150. So with this info, it will give you more momentum to have the end in mind. I like to set them on urgency here because the less you say, the more you make. 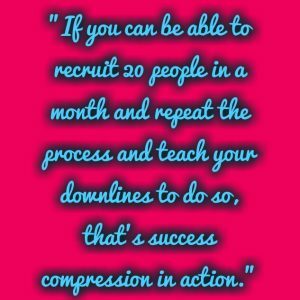 If you can be able to recruit 20 people in a month and repeat the process and teach your downlines to do so, that’s success compression in action. 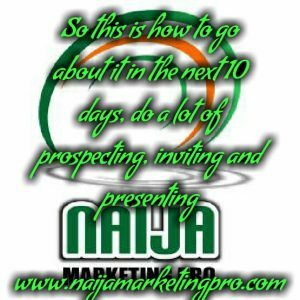 So this is how to go about it in the next 10 days, do a lot of prospecting, inviting and presenting ALL OUT MASSIVE ACTIVITY. The next 10 days, go on follow up. The money is in the follow up, it takes 5-8 exposure for people to buy new info. So the next 10 days, you are closing, use stories and questions to close. This is because stories sell facts tell. Now if you are full time on this opportunity, in the next 30 days, work 14 -16 hours in a day but have a day off. And if you are part time, work 8 hours. Charge your phone. Be committed and don’t just be involved. And work smart, don’t be the messenger but be the message, use the third party tools and it will do you good to share this info with your team players and make them subscribe to our post updates and success newsletters. Definitely, one of the medium to financial breakthrough. Awesome! Great and fully loaded. Thanks for sharing. Thank you Benedict Akpoyibo… We are existing because of you.